Lynn Goulbourn: Guitar and Vocals. Songs and guitar instrumentals from British Isles and North American Traditions. 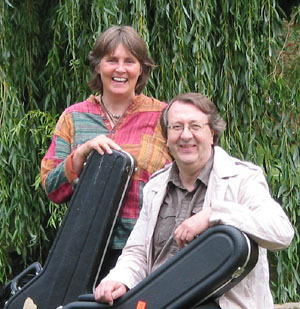 Steve Hicks and Lynn Goulbourn met at a gig in Staffordshire U.K. in February 2007. They hit common ground after playing a few songs together to finish the night and soon after began rehearsing collaborative material for Steve's CD "Guided by the Grain" released in November 2007. Live shows soon followed with Lynn contributing vocal numbers and harmonies at Steve's gigs and the pair have now developed into a fully fledged duo outfit. They play shows throughout the UK at folk clubs and acoustic music venues, with recent gigs taking them from the South of England up to the Scottish Borders. They have also played shows in the Southern and Mid Western United States taking in festivals and live radio performances. Lynn Goulbourn is an outstanding vocalist who can handle everything from the most demanding traditional songs or jazz standards to the gentlest of lullabies, in addition to providing subtle harmonies. Steve Hicks is one of the UK's leading exponents of finger style guitar. Drawing on an astonishing repertoire that encompasses Classical, Celtic, Ragtime, Blues and Folk styles. He delivers material with technical skill, astute artistic integrity and a natural sense of what it means to entertain. Steve has recently been recording in Germany for Acoustic Music Records, Europe's largest and most prestigious label for acoustic guitarists. He toured Germany in November 2009 as part of an international guitar quartet. In addition to the incredible range of musical styles, the honest vocal delivery and the breathtaking displays of virtuosity from Steve's guitar solos, a most engaging thing about this pair is the blend of personalities they display on stage. They are at once totally at ease with themselves and the audience. Their shows create a wonderful, memorable experience. Catch them as soon as you can!